LONDON - Nov. 8, 2016 - PRLog -- Four European IPOs and one Japanese IPO have been shortlisted for the TMT IPO of the Year 2016 award, at this year's TMT Finance World Awards 2016, which will be presented to the companies and their advisers in London on November 30. Despite difficult market conditions after a turbulent year for global equity markets, there were several standout listings in the TMT sector over the past 12 months, contributing to a very strong shortlist of five IPOs competing for the coveted award, which was last year won by Cellnex Telecom of Spain. The 2016 candidates include British and French media companies, Ascential (formerly Emap) and Mediawan; Japanese messaging app service Line; Dutch ecommerce firm takeaway.com; and Nordic payments company Nets. The five floats raised a combined total of around US$3.5bn across European, US and Asian stock markets. Banking advisers which made the shortlist include Deutsche Bank, Morgan Stanley, Nordea, JP Morgan, Societe Generale, Bank of America Merrill Lynch, Goldman Sachs and Nomura. 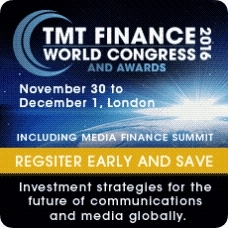 The TMT Finance World Awards 2016 follow the first day of the TMT Finance World Congress 2016, taking place at The Grange St Pauls London on Nov 30. The awards reward excellence in deal-making in the telecom, media and technology sector globally. Other award categories include: Telecom M&A Deal, Technology M&A Deal, Media M&A Deal, Telecom Towers Deal, TMT M&A Adviser, TMT Leadership Award and TMT Financing Bank. IPO in Denmark, valuing it at DKr30bn (US$4.8bn) and raising DKr5.5bn. September 2016. Advisers: Deutsche Bank, Morgan Stanley and Nordea. IPO raised E250m on the Euronext Paris to fund acquisitions in Media sector. April 2016. Advisers: JP Morgan, Deutsche Bank and Societe Generale. Advisers: Bank of America Merrill Lynch and Goldman Sachs. Advisers: Bank of America Merrill Lynch and Morgan Stanley. IPO raised US$1.14bn via a dual listing on the Tokyo Stock Exchange and the New York Stock Exchange. July 2016. Advisers: Nomura, JP Morgan, Morgan Stanley and Goldman Sachs.